Malta 7th October 2010: This is one of the most important subjects you can discuss on this website. Many, perhaps all, problems regarding the treatment of our domestic cats originate in a lack of proper understanding of the cat. Although there are many people who are wonderful cat caretakers, some are ignorant about how to care for a cat companion and how to humanely and decently deal with feral cats. Let’s remind ourselves that feral cats were once domestic cats or their parents or grandparents were. Please note: This page contains four photographs. You can see large format versions by clicking on the photograph. Have a look. They look better larger. I have written about Martha in a previous post. She is the premier cat rescuer on the island of Malta. She is a cat expert having rescued cats for 40 years! 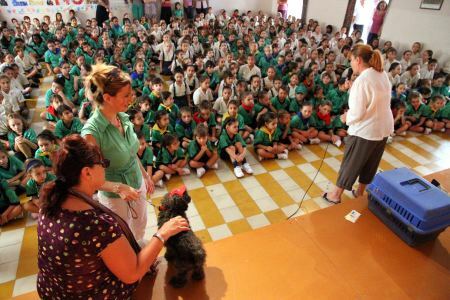 Being known throughout the island, Martha was invited to attend St. Josephs School to give a little talk about the domestic cat and dog, indeed any and all animals. She was invited by Maria, a teacher at the school. The school is a private girls school run by nuns and owned by the Roman Catholic church. The standard of education is high. A lot of praise must go to Maria for having the imagination and determination to organise this event. And it was an “event” I promise you! It was not part of the usual classroom activities but a special session in a large room. Although Martha was free to express her views about animal care, the underlying purpose, as I saw it, was to educate children about respect for our companion animals, to respect their rights and to never be cruel but the opposite: loving towards them. This is so valuable. I think it is essential in fact. It is the children who can carry forward to the future good animal caretaking and welfare. There is always room to improve. The children were exited and thrilled and this event will hopefully stay clearly in the memory of these 4 to 10 year old children through to adulthood. Martha will have sown the seed of good companion animal care and as a consequence many cats and dogs will enjoy better lives. This really is at the root of what we should be striving for. The photographs speak for themselves. There is a lot of excitement, laughter, joy, love..and education going on in this hall. As you can see in the photo above Martha is seen carrying Muttley her dog for the girls to touch as see. Muttley is an old and partially disabled dog but a wonderful dog nonetheless. He is marvelously well behaved despite the excited attention being payed him by a large crowd of young girls. Martha also brought along Buddy one of her cats. He is a special one too; very calm and laid back – ideal for the job at hand. I was highly impressed with this “event”. This is something that should be repeated all over the world. I am sure Martha is thinking how she can do some more! Of course it depends on the school and how enlightened they are. St. Josephs is certainly that. If even a small percentage of these school girls learn to love cats half as much as Martha the world will be a much better place for them. Another important part of this program, which was particularly good to see was that the children had been asked to get together all the cat food they could find to give to Martha to help support her cat rescue organisation, Kitty Appeal. I am pleased to say a hefty load of food was given. It more or less filled the boot (trunk) of Richard’s car. Well done the children. Martha is very grateful and thanks you all. Martha is doing a series of talks to children, which is wonderful. 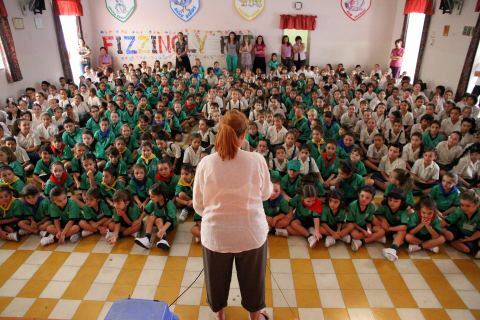 She recently visited another school, Stella Maris College, Gzira. Martha says….”I had another successful talk with the young boys from Stella Maris college. A substantial amount of food was also collected and the boys can be seen bringing it onto the stage while I was talking. Mutley also enjoyed being carried around by the assistant head. It was a great success and I will be going to another college soon. 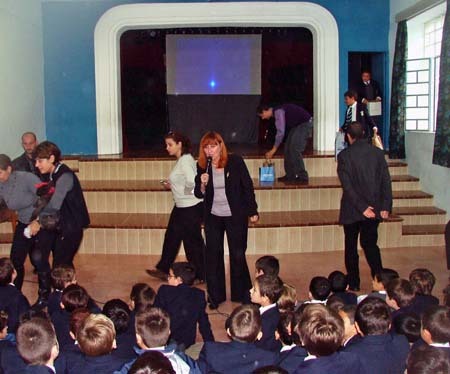 Martha Kane Educating Children – a valuable service. 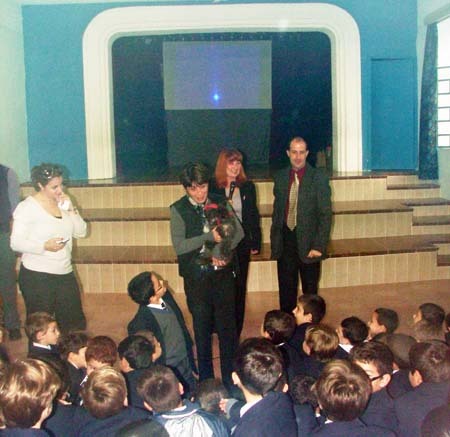 The topic of the talk was homeless animals and the importance of neutering. The person responsible for instigating the talk was Matthew Micallef, who is the parent of a boy who attends the college. Well done Martha and all those who organised it. These talks are very useful and proactive steps, the rewards of which will hopefully be seen in years to come. Thanks Gail and Ruth for nice comments. This is the first time I have seen this sort of thing done and as you can tell, I was impressed. I like the idea of children collecting cat food and giving it to Martha for her rescue and feral cats. It is doing something positive rather than discussing it and that coupled with Martha’s talk is a nice combination. I rate this sort of educational program a real success. There should be lots more. Martha Kane’s work is so important. It is also very heartwarming to see the reception she got in Malta. Children grow into adulthood and, hopefully, Martha’s lessons will filter through to new generations. Our local shelter works with children; however, they cannot volunteer at the shelter unless they are at least 16 years of age with parental permission (insurance regulations). Younger children are welcomed to assist in fundraising activities and they are wonderful! This is a wonderful thing to do, as educating children about animal welfare means this knowledge ensures most of them grow up caring about animals and respecting them too. Many years ago when I was young I used to help the RSPCA local secretary do this around schools and it always went down well. Sadly the RSPCA have mostly bad press nowadays and I don’t think they do it any more, at least they don’t in our area. But we do have Kays Hill no kill Sanctuary where children are made welcome to meet and learn about all animals,birds and fish, over 300 there at present,indoor and outdoor types,from Trevor the turtle to Sugar the horse. A lot of unkindness to animals is simply ignorance passed down from parents.